The crew at Snow King Mountain — like their colleagues throughout the region — has been working around the clock to make snow for the Jackson town hill’s Dec. 1 opener. 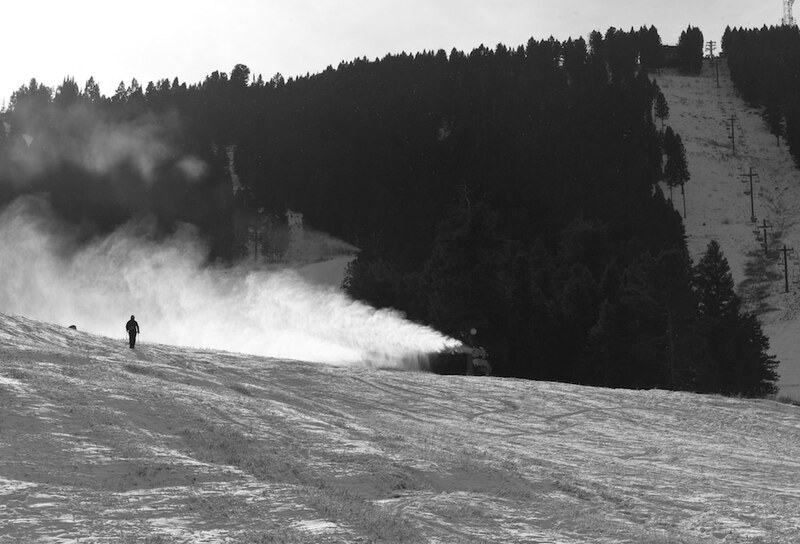 Snow cannons are set up on the bottom half of the mountain shooting out streams of water and jets of air that combine to produce artificial snow when temperature and humidity are at certain levels. A cold snap in recent weeks has enabled the production of mounds of snow that will be pushed across the slopes by grooming machines. Some of the snowmaking is directed at the base area where a snowmobile snowcross event is scheduled for Dec. 7 and 8. Back in the day, when the folks in Jackson were beginning to ski and ski jump for sport, the season began up on Teton Pass. There, community members assembled a two-stage rope tow out of a four-wheel drive vehicle. Once winter came to the valley floor, the rig was moved down to the slopes of Snow King, a hill originally named Simpson Ridge. Kids quickly learned to grab on to the rope behind an adult whose weight would keep the line within reach of the ground. Otherwise they were in danger of being lifted off the snow by the taut lift line. Avid skiers still take to Teton Pass in early season. In-town activity today is aided by snowmaking, which extends the ski, snowboard and snowmobile season at both ends. Snowmaking doesn’t deter avid hikers who regularly scale Snow King’s slopes to the summit, 1,571 feet above town. In this scene, a hiker makes her way toward a snowmaking gun.